Jake Sansby scored for Peterborough Northern Star against Kirby Muxloe. 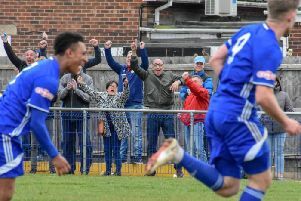 Deeping Rangers surely kissed goodbye to their lingering title hopes in the United Counties Premier Division today (April 6). 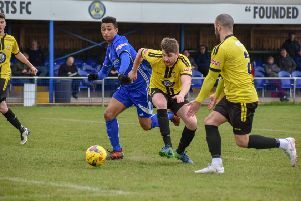 Deeping, who won a County Cup on Wednesday, were thumped 4-1 at lowly ON Chenecks, while leaders Daventry came from behind to win 2-1 at fading Holbeach United. Daventry now lead second-placed Deeping by nine points with just four matches to go. Will Bird did fire Holbeach into an early lead, but Daventry scored twice in the second-half. The Tigers were aggrieved that one of the Daventry scorers hadn’t been sent off in the first-half for an elbowing offence. Pinchbeck United also scored early through Jordan Nuttell’s terrific volley, but they were also beaten 2-1 at home by Newport Pagnell. The winner arrived in the final minutes. After 13 games without a win, Peterborough Northern Star have now collected two wins in a row. A Robbie Ellis goal and a superb Jake Sansby finish were enough to see off Kirby Muxloe 2-0 at the Branch Bros Stadium. Lee Clarke and Josh Edmundson both scored twice as Blackstones whacked Thrapston 5-1 in Division One. Jones De Sousa had opened the scoring for the fifth-placed Stones. But Bourne were well beaten 4-1 at home by leaders Lutterworth Town. Zack Munton scored Bourne’s consolation goal. Wisbech St Mary are off the bottom of Division One North in the Thurlow Nunn Eastern Counties League. Josh Burrows scored twice and Jack Brand was also on target in a 3-1 win over AFC Sudbury Reserves. March Town remain fifth after goals from Craig Gillies and Danny Emmington clinched a 2-1 win at Leiston Reserves. Premier Division: Holbeach United 1 (Bird), Daventry Town 2; Northampton ON Chenecks 4, Deeping Rangers 1; Peterborough Northern Star 2 (Ellis, Sansby), Kirby Muxloe 0; Pinchbeck United 1 (Nuttall), Newport Pagnell Town 2. Division One: Blackstones 5 (Edmundson 2, Clarke 2, De Sousa), Thrapston Town 1; Bourne Town 1 (Munton), Lutterworth Town 4; Huntingdon Town 0, Anstey Nomads 5. Division One North: Leiston Res 1, March Town United 2 (Gillies. Emmington); Wisbech St Mary 3 (Burrows 2, Brand), AFC Sudbury Res 1.